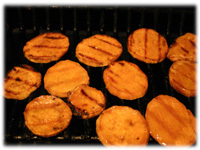 These delicious grilled sweet potatoes are first sliced into 1/4" medallions then placed on the grill where you baste them frequently with a rich honey, butter and curry glaze. 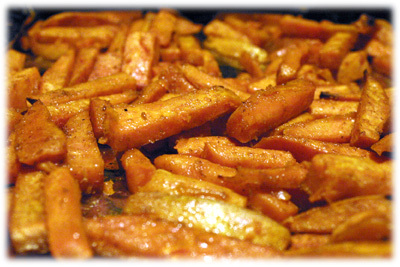 These make a really nice change of pace from regular sweet potato fries. 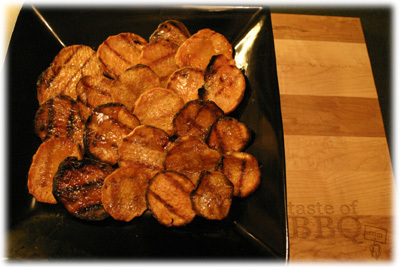 Easier to make at home then the sweet potato fries, these medallions grill up beautifully with no more work then basting and flipping now and then. 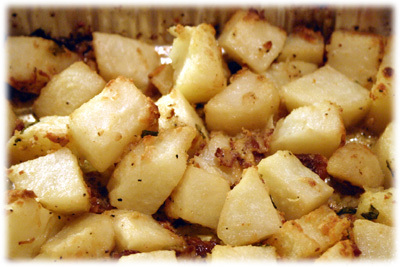 When they're done, just plate them and add a little salt and pepper. These make a great snack too. 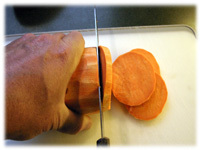 Peel the sweet potatoes and cut into 1/4" slices. 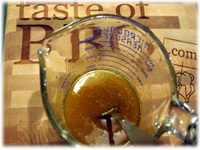 In a glass bowl, combine the melted butter, honey and curry and stir well to combine. 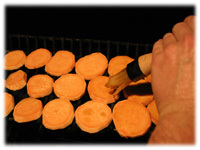 Brush one side of each medallion with the butter-honey-curry mixture as you place it on the grill, brushed side down. 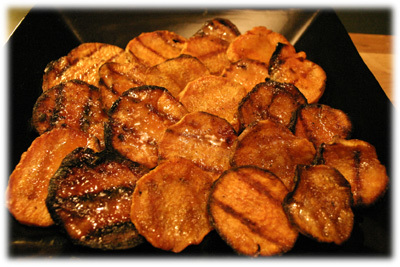 When all the sweet potatoes are on the grill then brush the tops with the melted mixture and close the lid. Lift the lid from time to time and baste the sweet potatoes. Flip them over occasionally so they develop nice grill marks on the surface and continue to baste them so they develop a nice glaze. They will take around 20 - 30 minutes to cook depending on the heat of the grill and whether you've put them on the top rack or on the main grates. I cook these on the top rack so they're out of the way while I use the main grates for cooking other things. Keep an eye on them and move them around if some begin overcooking on the edges. Best way to check them is to taste (I mean test) one right off the grill. 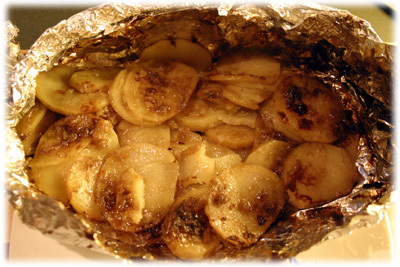 When ready, remove them from the grill to a serving plate and stand back.